First Perrie Edwards and Zayn Malik, then Kermit and Miss.Piggy, and now another couple have headed to splitsville – does true love still exist anymore? Made in Chelsea’s Spencer Matthews and Lauren Hutton have split after first getting together on the E4 show. Although Lauren has just shared a snap of what seems like her and Spencer in bed together, captioning it ‘Spoons’, she’s been hanging out with rugby fitty Thom Evans lately, and no doubt showing him what he’s missing. 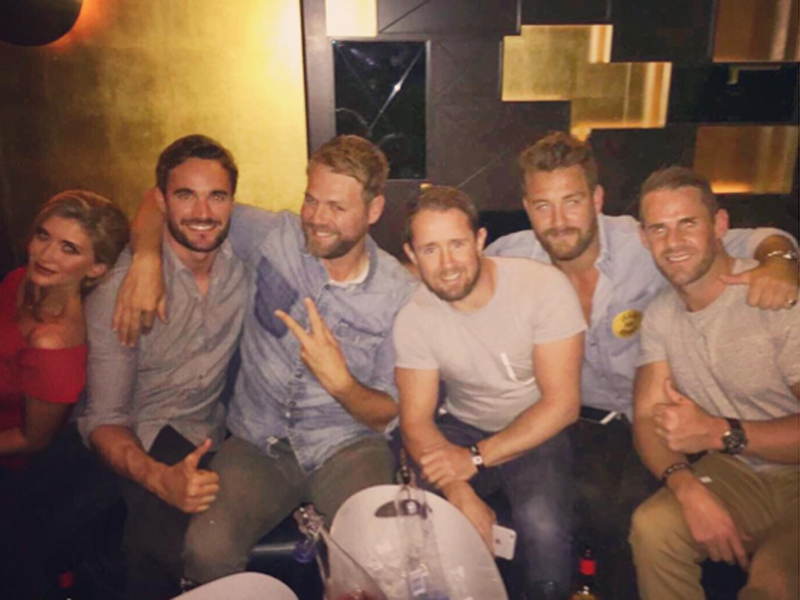 Fellow Made in Chelsea star Fran Newman-Young shared a pic this week of Lauren cozying up with some a bunch of lads, lads, lads, including Thom and also ex-Westlife member Brian McFadden. Odd. Spencer has had a history of being a womanizer, having cheated on girls in the past including ex-girlfriend Louise Thompson on the show. He’s been invovled with many other girls on the show, including Lucy Watson, but it seemed like he was finally done with his bad boy ways when he got into a relationship with Lauren. Well, apart from that time he snogged someone else. Earlier on in August, it was rumoured that Spencer was quitting Made in Chelsea to spend time on his very own reality TV show. WATCH when the Made in Chelsea boys played Would you Rather!